Yesterday had many of us suffering a Marmite-like response to Aretha Franklin's cover of Rolling In The Deep. Some loved it, some hated it, but with the release also came suspicions!! Suspicions that....brace yourself.... the Queen Of Soul's vocal weren't all her own, having had some help from a computer. SAY THERE AIN'T NO WAY! Well, what better way to quash those rumors than by giving the song a live showing! Taking the medley to the stage at the Late Show With David Letterman, the Diva sounded great- better than the CD version I'd argue. I was enjoying it when the Diva stayed out of her head voice. However, when she did choose to "experiment" up there, I can't lie, the wheels fell off and it sounded out of tune (to me). Other than the head voice distracting, Cissy Houston was also catching my eye consistently- she was the singer on the end. That poor lady did not know what was going on, missing dance steps and mouthing lyrics she did not know. 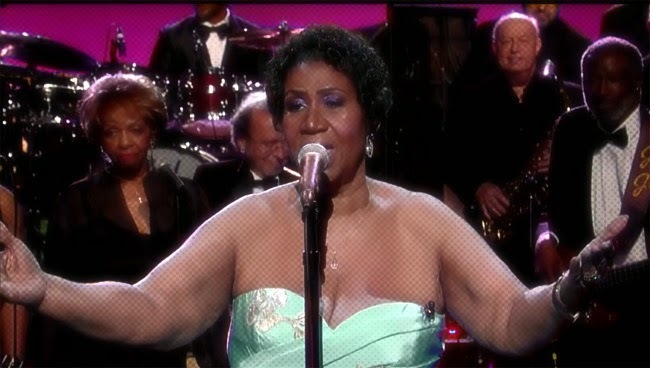 What made the whole thing worse was that she was constantly in shot, being behind Aretha's shoulder. Honestly, why was she even there? That's a Diva that should be headlining, not backing someone else!